Second grade student William Clancy was the "Star of the Week" in Joanne Williams' classroom. 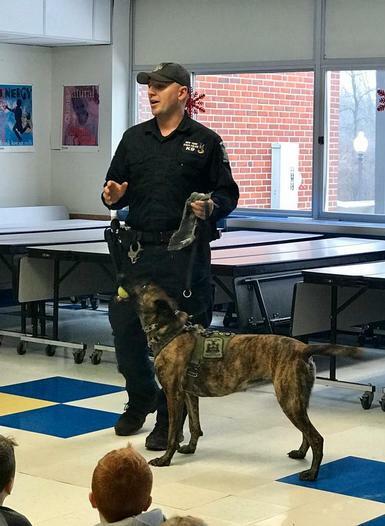 His wish was to invite his relative, State Trooper T.J. McDonnell in to visit the second graders and tell them about his work with the K9 unit. Trooper McDonnell visited Waterman to share what he and his dog Mic do as community helpers. Trooper McDonnell discussed the role of his trained search and rescue dog, and how he and Mic help his community. This visit was not only fun and interesting, but it also supports the second grade curriculum as students have begun learning about communities, community helpers and identifying those who provide a service or who are a producer of goods. The students enjoyed the visit. Thank you Trooper McDonnell and Mic!